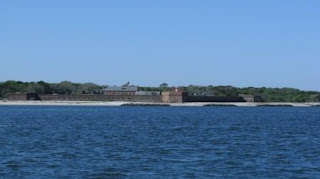 We passed Fort Clinch as we left Fernandina heading off shore for the trip up to Brunswick. The winds had finally abated so we had a pleasant trip north and were greeted by the St. Simon's Light as we came in heading for Brunswick Landing Marina. We had hardly settled in before visits with old friends started and Andy showed up with a loaner truck for us (thanks again, Andy!!). We saw lots of folks and managed to eat at our favorite restaurant twice! We've often recommended Christie's and now have to amend that. Jayson and Christie, who owned Christie's, now own Cargo (www.cargoportsidegrill.com/) which was another local favorite a couple blocks down Newcastle Street. So Christie's is no more, but Jayson and Christie are combining the best of both restaurants at Cargo. While at Brunswick Landing we enjoyed regular visits by the local great blue heron. The dock mistress's chihuahua, Killer, made regular appearances also. They say she may be "with pup" but she hasn't let that interfere with her fashion sense. 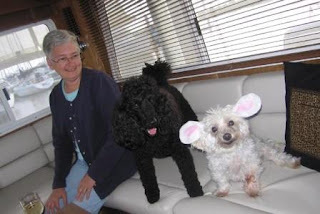 Rocky was excited when Mike and Linda (Sea Dream) showed up with his "BFF" Louis for a few days. Louis was even willing to give his bunny outfit to Rocky - only because the pants were too small - he hated not being able to wear it himself! As usual, we decided to extend our stay, sort of, in Brunswick. That is Carolyn Ann stayed in Brunswick. Our change in plan included a trip to Gainesville, FL to attend the annual Mirage seminar. We spent most of three days listening to presentations by Ken, the owner of Mirage, venders, and various systems experts. Of course there was plenty of time to socialize with the other boat owners also! Ken gave one of the demonstrations that many of us were interested in - gel coat and fiberglass repair. Joe was allowed to watch, but I don't think I'll be letting him actually try it - have you ever seen him with a caulk gun??? After the seminar, we drove down to St. Pete to see John and Meredith and their new apartment. We hadn't been to St. Pete before, but we quickly saw the attraction. The neighborhood they are renting in is made up mostly of early to mid 1900 homes. Lots of craftsman style houses, some brick paved roads and lush (sometimes out of control) tropical vegetation. One tree in particular caught our attention. Long viney strands hang down with potato looking things attached. Anybody know what kind it is? Over the weekend we toured around a bit and visited the Sunken Gardens. Instead of the tourist trap that this sounded like it might be, it was filled with winding paths through all types of palms and other plants - some identified, some not. They have large heaters so they can grow plants that are too tropical for the area. They even have a few flamingos! We really enjoyed it and would recommend it if you're in the area. After returning from St. Pete, we visited with Neil, Sheila and Rio (Silver Queen), who had arrived at Brunswick Landing while we were gone. Once we'd stocked up on groceries and Joe had made innumerable trips to Boater's World (big bankruptcy sales! ), we took off, finally feeling like our cruise was starting. We immediately went offshore - sounded like a good idea at the time. I was not having fun - swells were probably four to six feet - nothing scary, but not especially comfortable. We came back inside earlier than Joe had planned. I'm sure it had nothing to do with me turning that greenish shade. The next day we spent a much better day offshore. The only problem was the port engine. Since we got the boat, the port engine has run a bit hotter than the starboard. Joe had come up with different rationales for why that might be normal. While we were in Green Cove, we had engine maintenance done by Bo who said it probably had to do with the heat exchanger. Evidently they are sent from their manufacturer coated with something. Sometimes the "something" isn't completely cleaned off and will gunk up things so the engine isn't cooled properly. At least that's the way I understand it. At any rate, Bo thought it might take care of itself. Bottom line is, it didn't take care of itself but kept getting worse. So we finally stopped at a marina in Hilton Head. Thanks to Jim McQuade (Lone Wolf), who lives there, we found a great mechanic (Marine Tech) who took the part to his shop on Friday and re-installed it Saturday morning - no premium on the labor for weekends! We were on our way again before noon. There is a section of the ICW in Myrtle Beach called the Rockpile. As the name suggests, there are rocks on both sides of the narrow channel. We were cruising along at our usual stately pace of about 71/2 knots and a sport fisher hailed us. Joe answered and asked them to switch radio channels, which is customary, to discuss a safe pass. The sport fisher, "My Lady," didn't respond and, after waving at Joe to get out of his way, proceeded to try to pass making the biggest wake he was capable of - actually using the wake to push us aside. Through Joe's quick boat handling, we avoided disaster but not by much. There was no response to Joe's irritated radio transmission, or the one we heard shortly after from a marina up ahead that he also waked. Through various internet contacts, Joe was able to find out that the boat was being driven by a transport captain. He also learned that he ended up in a marina with a blown engine! There is justice in the world. Sometimes it can get a bit boring. But then something will happen. Like a group of dolphins swimming along beside the boat. This is not a great picture - but I have a whole bunch that only show the water where the dolphins had been! As we were approaching the infamous Sunset Beach Pontoon Bridge, we passed these goats. Actually, at first we thought they were deer because of their size. Neal - you need to get one of these. What a feast! The Sunset Beach Pontoon Bridge is a one lane bridge that only opens for boats hourly. Car or boat, you almost always have to wait to get across. Luckily, a new high rise bridge is under construction, much to the dismay of some locals who love their bridge. This may be our last picture of the pontoon bridge. Even that guy behind us had to wait for it to open. Joe and I got a kick out of this house last year - but this year they added the polka-dot boat so we thought it was worth another mention. As we've been coming north, we've hit a spell of unsettled weather. We've had to make some unscheduled stops or look for protected anchorages because of impending thunderstorms. One night we'd had a long day and anchored about 6pm. We'd been watching some isolated storms on radar and turned on the tv once we were settled. The local news was non-stop weather because of tornado sightings. We got out the road atlas to try to figure out where we were. About the time I found a town that looked close to us, the weather guy said that was where the storm was headed! We made what preparations we could and thankfully watched the storm pass to the north of us. The next night we rafted up for happy hour with a boat that had been anchored near us during the tornado scare. We'd been hearing them on the radio for a couple days. The boat name is "Forever 39." Our friends, Bruce and Joan, have a Great Harbour with the same name. Tom and Charlene Cooper who own this Forever 39 have never met Bruce and Joan, but have heard of them from some other Great Harbour owners they've met. We had a nice visit and mutual boat tours. The next day we crossed Albemarle Sound. The winds were predicted to be 10 to 15 mph, waves 2 to 3 feet. They weren't. (that 34.1 is wind speed) By afternoon they'd issued a small craft warning. Also, there were more crab pots all over the sound than we've seen anywhere before. By the time we made it to Elizabeth City we were beat! The next day, my sisters, Lynn and Jean, and Jean's husband Rich interrupted their weekend at the beach to come meet us for lunch and deliver mail. It was a beautiful, calm day! Today, Monday the 11th, we've cruised up the Dismal Swamp Canal on a cool, cloudy day. I'm negotiating for a Mexican dinner when we stop at Elizabeth's Dock at the Deep Creek lock!